I seem to have finished loads this month, without really consciously trying - which probably means I'll finish about two products next month. 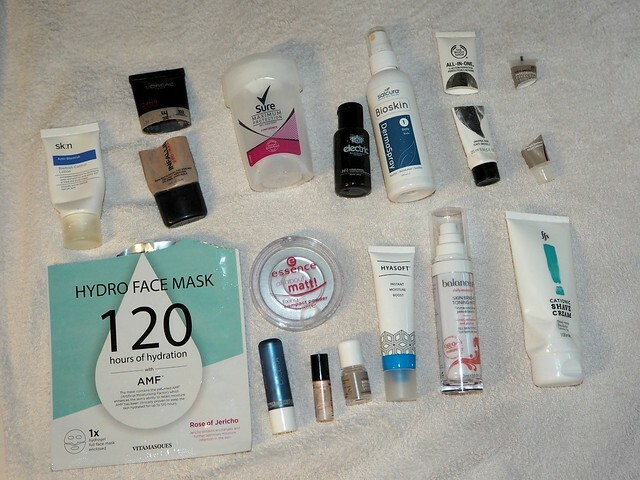 Still, this is good progress for me trying to slim down my ridiculous hoard of beauty products! Will Repurchase: Kind Natured Amber & Pink Pepper Body Wash | This smells lovely, leaves my skin feeling clean and soft, and doesn't aggravate my eczema. // Sure Maximum Protection Anti-Perspirant | These are the only deodorants I trust! // L'Oreal Infallible Pro 24H Matte Foundation | This is the US version which I much prefer to the UK one - it sits far better on my skin as well as lasting longer. // Garnier SkinActive Micellar Oil Infused Cleansing Water | I love this stuff for removing my make-up before a proper cleanse in the evenings! Really effective and doesn't sting even around the eyes. // The Body Shop All-In-One Instablur | I love this, too! I have a few other primers to use up but I'll definitely be coming back to this one. Might Repurchase: Vitamasques Hydro Face Mask | I do think this is expensive for a single-use mask but I'd consider it for a special occasion as it worked pretty well. | The Hero Project Hyasoft | I quite like this under my moisturiser for an added dose of hydration. // Balance Me Skin Bright Toning Mist | I have to say I didn't really notice any skincare benefits from using this, but it did smell nice and feel refreshing on my face. // Merumaya Gentle Exfoliating Toner | This was a dinky sample bottle which did me two applications - not really enough to get a proper idea, but I am keen to try it more thoroughly. // Lacura Lip Balm | These are an absolute bargain, I think they're about £1.50 from Aldi and they contain SPF which is a bonus! This one lived in my car for lip hydration on the go. // Yes to Blueberries Smooth & Shine Conditioner | This was quite nice, smelt good and left my hair feeling soft and smooth. // Electric London Shampoo | This isn't a brand I'm familiar with but I did quite like this shampoo - it left my hair feeling soft, with plenty of volume. // Salcura Bioskin DermaSpray | I quite liked having a body moisturiser in spray format and felt this worked reasonably well on my eczema-prone legs. // Merumaya Overnight Recharge Night Cream | I felt like this was a bit heavy for my skin, but it might be something I'd buy in a few years time as my skincare needs change. Won't Repurchase: Benefit High Beam | I do love this highlight, but I wouldn't buy it again when I can get an almost perfect dupe from Asda for £3.50! // Kind Natured Volumising Rosemary & Mint Shampoo (x2) | I really liked this at first but I found it quickly became less effective for my hair and by the time I finished these two bottles, it wasn't leaving my hair feeling clean at all. // Friction Free Shaving Cationic Shave Cream | I did really like this but unfortunately you can't order it on its own from FFS, and I don't like their blades so have cancelled my subscription. // Skintifique Moisturizing Lotion* | This worked okay but the price would put me off buying it. // Essence All About Matt! Fixing Compact Powder | This shattered early on which put me off, but it also did very little to keep me matte. // sk:n Anti Blemish Lotion* | This smelt like rubbing vodka on my skin and I didn't dare use it on my face. Nanokeratin ReVive Invigorating Shampoo | I've tried this before and do quite like it but there's no way I can afford to buy it! From $56/320ml here. // Garnier Ultimate Blends Strength Restoring Balm | This worked reasonably well to nourish the ends of my hair, leaving it feeling soft and smooth. I'm terrible at remembering to use hair masks but I'd be tempted to give this one a whirl. £3/300ml here. 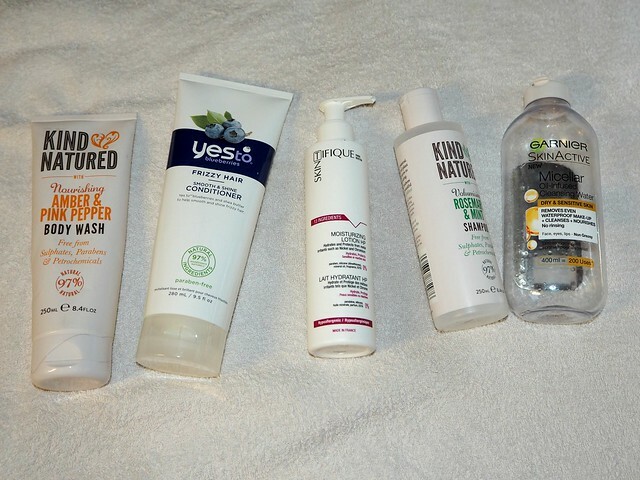 // Aussie 3-Minute Miracle Reconstructor Deep Conditioner | I used to love Aussie products because they smell amazing, but sadly had to stop using them due to the SLS and silicons. This was nice as a one-off but not something I'd use regularly. £4.99/250ml here. 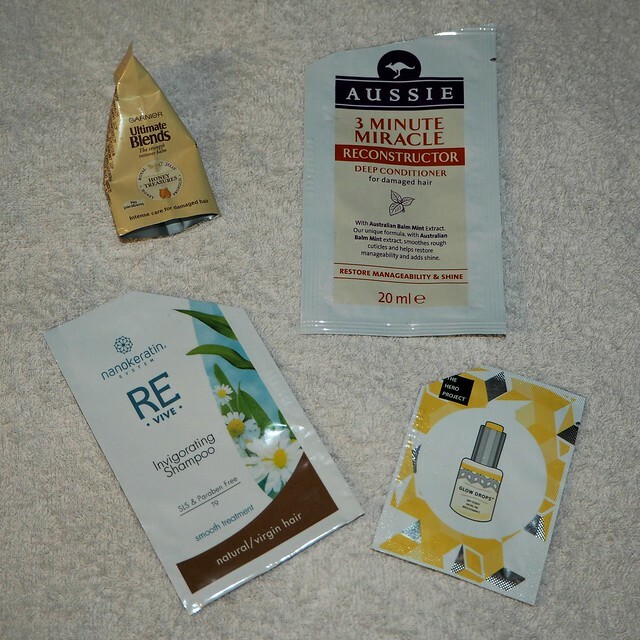 // The Hero Project Glow Drops | This was heavier than I was expecting and felt quite sticky on my skin - I'm in two minds but I do have about another 8 sachets to use before I need to decide whether I want to buy it! £24/30ml here. • See friends at least twice. I sadly missed a pub night last night due to being ill, but I have managed a couple of walks with a couple of different friends, not to mention numerous cups of tea and a day in the hills with my best friend. • Read at least one book. I've nearly finished! I have no excuse for this, I had a week and a half off work... I just haven't got on with it. • Try going to the gym twice a day. I've managed this quite a few times, although I've not been well this week so I've eased off the gym, and I wasn't going to trail through twice whilst I was off work. I've found that as long as I plan in advance what I'm going to do when, taking into account things like where I'm starting/finishing work, it works pretty well for me. • Interviews. This wasn't really a goal, more something I was hoping for... But I'm proud to say I've been offered an interview! It's not til May so I've got plenty of time to prepare for it; it's my first round of applications for Clinical Psychology, which is a notoriously competitive course to get onto, so I'm just going to see how it goes - but I'm pretty pleased to have even got an interview first time round! So I make that four out of five - I need to get my act together in April and get back on track with my reading goals! The lovely Gwennan shared a look-through of her 2017 Bullet Journal so far. I've basically accepted that I don't have the time or the patience to create a BuJo of my own, so I'm just living vicariously through Gwennan now. Bee wrote this fab post on annotating books which really got me thinking - why don't I write in my books!? I also enjoyed reading Jasmine's thoughts on dupes of high-end beauty products, finding that I agreed with most of her points. Here on The Indigo Hours, I shared a second instalment of ways to practice self-care in five minutes or less, and ten of my favourite beauty products for under £10, so do check those out! Much like the last week of February, I'm feeling pretty sorry for myself at the end of March as my glands are so swollen it hurts to move my head, but hopefully I'll be feeling better soon! That aside, it's been a pretty good month - it was nice to have a week off work, and I've had good news interview-wise. 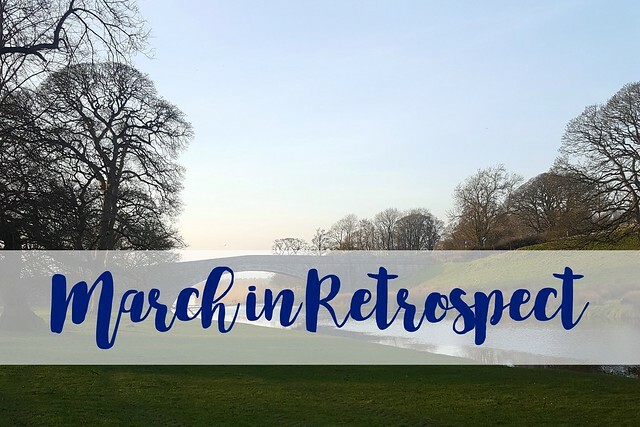 How has your March been? What are you most looking forward to in April? What book have you been reading? What a shame the Essence powder, I'm really loving the Essence brand at the moment. Especially their nail polishes. Well done for ticking off your goals for the month. I loved this post! Always nosy to ready what other people are using up in their month! I can't believe it's almost April...we have sunshine..in GLASGOW! 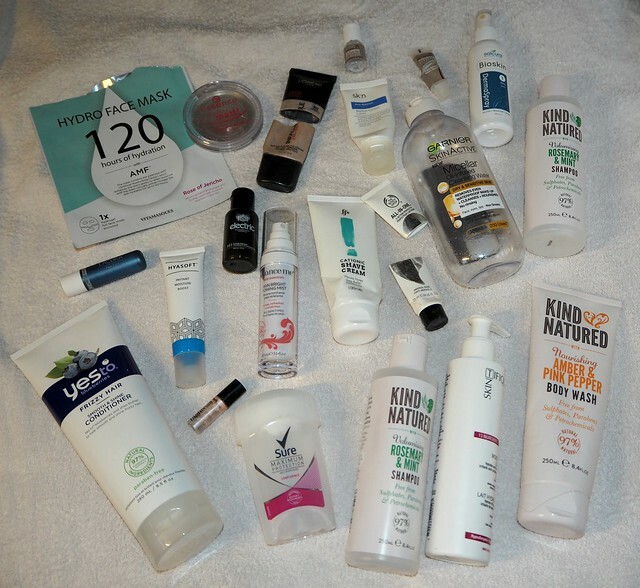 I love that you have gone through so many products, I really should do the same I too have a hoard of products unused! I was thinking of getting Benefir High Beam but I will have to look out for the Asda version now!